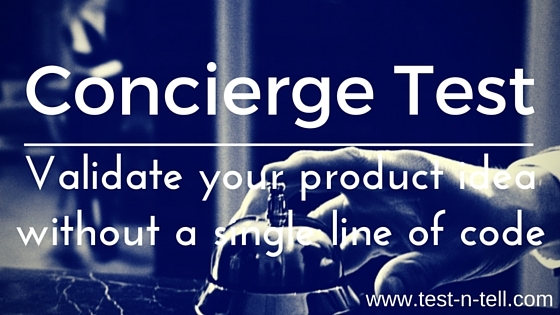 What is a concierge test? It's an emulation of a product work party or fully done by manual human work. In other words, instead of building actually working MVP of your product - you are using your own time and work to deliver value to customers. They wanted to sell shoes online. But they didn't know what kind of shoes people are going to buy. To find out they took a camera and went to local shoe shops. They made a picture of every shoe model there were and placed them online. When people were "buying" shoes online on their site, co-owners were going to a local shop, buying shoes customer wanted and manually packaging and mailing an order. Later, when they found out what kind of shoe people were actually buying they went to producing companies and signed the deal. Only when they were sure people are buying they invested in automatic order processing and other technologies. Have you ever had a problem to schedule a meeting? If you're longer than 5 minutes in a business then you'd probably answer "yes". Scheduling meetings could be very time-consuming. It could be much easier when you have a personal assistant. She knows your calendar. She communicates on your behalf. She informs you when everything is set. "Amy" is such assistant. One remark: "Amy" is not real. "Amy" is a software written by the x.ai to help business people with better meeting scheduling. I encourage you to read about the wonders "Amy" might do. "She" is very intelligent. Artificially intelligent. It's a very clever and expensive software that requires some very best engineers to build. And if you're an x.ai founder with a great idea but no money to hire those first class developers. What can you do? Quite simply - you schedule meetings yourself. You do it before you're sure it's important enough problem for people to pay for solving. That's what Dennis R. Mortensen said he did before coming up with an x.ai idea. I don't know for sure whether Dennis did a concierge test before starting to build software. Or maybe he still uses some sort of a human helping hand to run "Amy" so smoothly. The thing is: concierge test would be a great starting point for this kind of idea. Before spending real dollars on software, spend real human work on "faking" software and see if you can deliver real value to your customers. I've learned about concierge testing when I started to think about my own little idea. I believe that all product people are doing some kind of competition monitoring from time to time. We want to know when our rival releases a new major feature or does a site re-design or hires some big data engineers...etc. Currently, we are mostly doing it manually. Obviously, it should not be this way, hence: www.competitorsmonitor.com . It's a concierge test at the moment. I don't know what features the product should have. Don't know how those features should work. Don't know if people care enough to pay for it. But I'll find out pretty soon and without spending a fortune. Concierge and the "Wizard of Oz"
Another term you might find online and in the Lean books is "Wizard of Oz" testing. It's quite similar to a concierge test. "Wizard of Oz" is also "faking" a working product with human work. The only difference is that "Wizard of Oz" suggests that your customers don't know that product is "not real". In the case of concierge testing, it does not matter whether your customers know how exactly you deliver them value. Next time you have a brilliant idea - think how you can validate it quickly and cheaply. Maybe try a concierge test. It's an easy way to validate a product idea by "faking" real product work but delivering real value to customers.